Start of Canyon Trail by the Overlook at Smith Rock State Park. 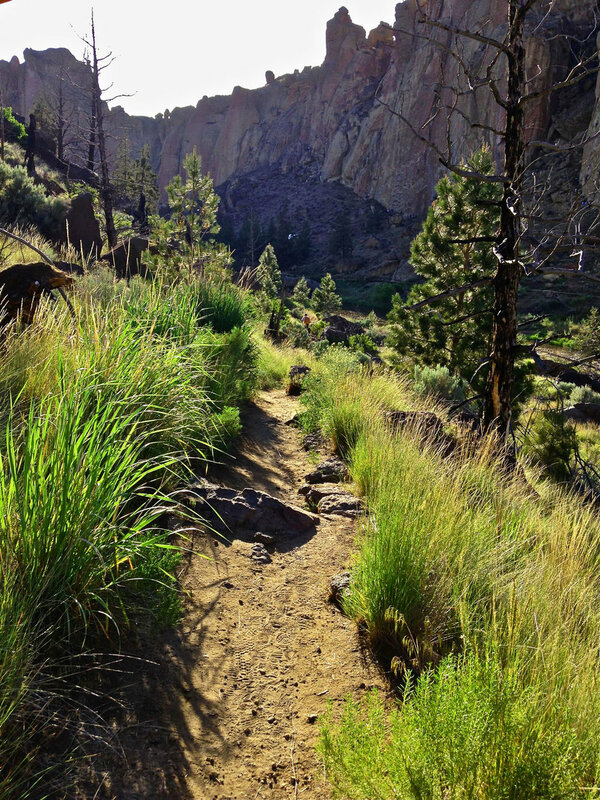 Canyon Trail as it bends around the Crooked River at Smith Rock State Park. Canyon Trail as it continues around the Crooked River before heading up out of the canyon at Smith Rock State Park. Canyon Trail as it turns upward away from the river canyon and winds up the hill out of Smith Rock State Park. The end of the Canyon Trail as it exits on to Wilcox Road outside of Smith Rock State Park. Follow the paved path into the park, staying straight on the gravel road past the junction to the Chute Trail. Using it to connect to the rest of the trail system? Keep curving to the right to where it joins up with The Chute Trail by the picnic area before the bridge. Want to see where the main trail goes? Continue straight at the junction to stay on the path as it follows the river toward Rope-de-Dope climbing area. Check out the .15 mile unidentified trail as it hugs the river’s edge. It then meets up with the official Canyon Trail where you’ll get great views of the popular climbing areas of The Dihedrals and Christian Brothers. As you keep winding left along the river you see Asterisk Pass, marked by a boulder resembling Woodstock from Snoopy comic strip fame. The Smith Rock Group with Phoenix Buttress, another popular climbing area, lies just beyond the horse ford, where on summer days you may see them crossing with their riders when the river is lowest. Continuing along the river, you get on a series of gentle switchbacks as you gain and lose 10-20′ of elevation entering some dense vegetation areas. Giant boulders appear along the path, sculpted like cave pods, some resembling stone houses. From here the path gets steeper, with 100+ feet of elevation gain until you top out at the junction. Either path takes you to the intersection of NE Wilcox Ave.
At this point, you can either go back the way you came or make a left to walk along Wilcox until it meets NE Crooked River Drive. Make another left to head back to the Welcome Center around .5 miles away.